Kaget+kecewa banget sebenernya pas baca berita yang satu ini..
adalah hal yang sangat membanggakan karena arashi terpilih untuk menjadi host kouhaku, dan juga jadi grup pertama yang menjadi host kouhaku.. The 61th Kouhaku Uta Gassen has announced the host to be Arashi and Matsushita Nao for the white and red teams respectively. According to reports, Johnny Jimusho has only agreed to let Arashi host the event in exchange for 6 frames of Johnny's groups to perform. 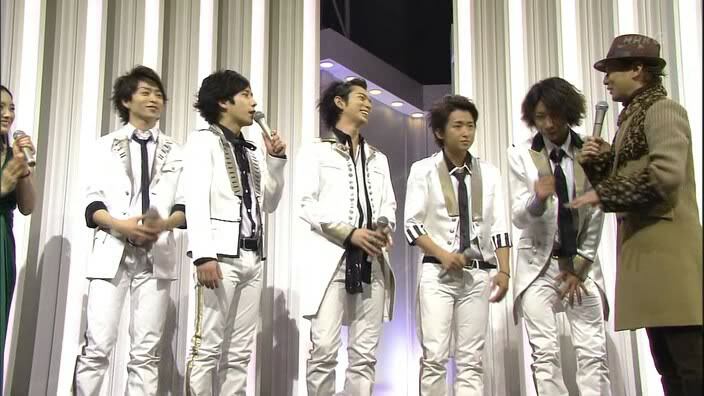 According to testimony from entertainment production authorised person, Johnnys has demanded that in agreeing to let Arashi host Kouhaku, NHK would have to give them 6 frames which include Arashi, SMAP, TOKIO, V6, Kondo Masahiko and NYC. If this comes about, it is no doubt that Johnnys has takeover NHK and it becomes a mini "Johnny's Countdown Concert". Welcoming into his 30th year debut anniversary, it is no surprise for Kondo Masahiko to perform in Kouhaku. But for V6 and NYC to perform it seems to be somewhat forceful. Music industry related person expressed that despite Kondo's participation in NHK's 『Nodojiman』 program on 21st this month, it does not necessarily imply NHK's intention to include him in Kouhaku's performer list. On the surface the organisation of Kouhaku is negotiating with the record companies for perfoming artiste's schedules, but in actual fact they are just taking on the mere support role as such, 80-90% of the decision authority still lies in the intention of the Jimusho. If NHK succumbs to the demand and allow 6 Johnny groups to appear, one quarter of the white team will be occupied by Johnnys as said. Naturally it will break the whole balance, and there will be voices of doubt arising among the Kouhaku staff. "At first NHK only wish to let Arashi take on the host and tried to resist the conditions raised by Johnny's Jimusho, but eventually they have no choice but to agree." Previously it used to be only 2 Johnny groups to participate while being increased to 6 groups this year. "No doubt controversy will arise, but if it takes place there will be no worries over the ratings". Inohara who appears in NHK's morning program has favourable ratings thus V6's appearance in Kouhaku can still be acknowledged. But for NYC to appear it will provoke much discontent as there are other senior groups in Johnnys who have more potential to perform in the event. If this rumor turns out true it will be difficult to address Kouhaku as Japan's annual music fest and the efforts of other artistes will be wiped out. mereka dr awal debut ampe besar sekarang jg g pake "disuapin"
kerja keras tuh kerja kerass!! kok jadiny kesannya pihak JE itu bikin kouhaku ngemis2 minta arashi gitu..
tapi kaya sumber diatas, list resmi kouhaku belum ad sih..